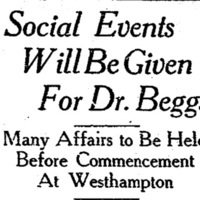 Article "Social Events Will Be Given For Dr. Beggs"
This article discusses the various activities that went on for the commencement of the farewell celebration for Dr. Gertrude Beggs, the Latin professor chair who was leaving to go teach at the North China American School in Beijing, China. Dean May Keller and Miss Pauline Turnbull held a garden party, Ms. F. Flaxington Harker, director of the Westhampton College Glee Club, gave a performance, and Dr. Gertrude Beggs was honored with a dinner celebration. 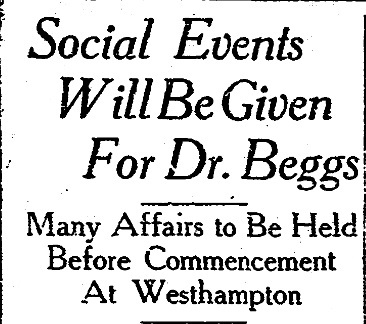 “Article "Social Events Will Be Given For Dr. Beggs",” Race & Racism at the University of Richmond, accessed April 18, 2019, https://memory.richmond.edu/items/show/511.